This book comes to Kane/Miller publishing from South Korea, but it could just as easily be set in any of the bustling Korean neighborhoods in America. 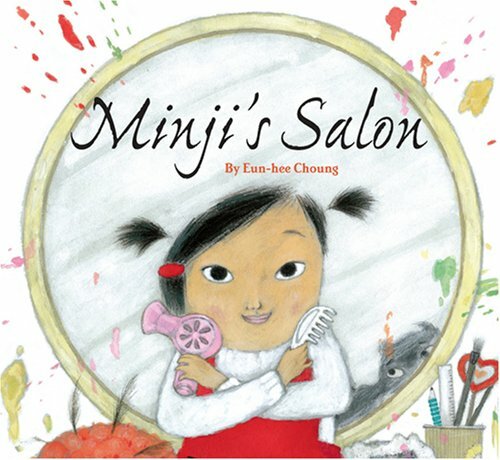 While her mother is getting her hair colored and styled, Minji follows suit with her own customer  a black dog  and in her own way. The child’s desire to do grown-up things is universal, and is captured well in this simply worded picture book. The illustrations are engaging, especially when capturing the expressions of Minji and her mom. Enjoyable, lovely book. 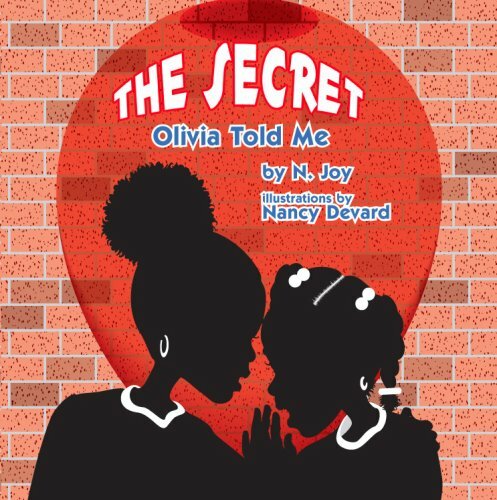 Olivia tells her friend a secret, and the friend lets the secret slip out. From there the secret passes along and gets bigger and bigger. In the end, the friend has to tell Olivia the truth and apologize, because it was the right thing to do. The story is good, though I could have done without the rhyming couplets. The cover is gripping with its black silhouettes with white accents against the red brick wall. The silhouette style continues throughout the book with the addition of a red balloon that gets bigger and bigger throughout representing the secret that is also growing. The end of the book includes a section to discuss the story including what secrets kids shouldn't keep. The artwork is simply wonderful, especially in capturing a diverse group of children only in silhouette. As a little girl turns seven, she watches her mother unpack saris to wear to her birthday party. While helping her mother choose just the right one for the special day, she pleads to wear a sari herself. Knowing that young girls like her aren’t old enough for the lovely garments, she reflects on their beauty. But sometimes birthday girls get special treats, and in this case it is getting to dress up like mama. 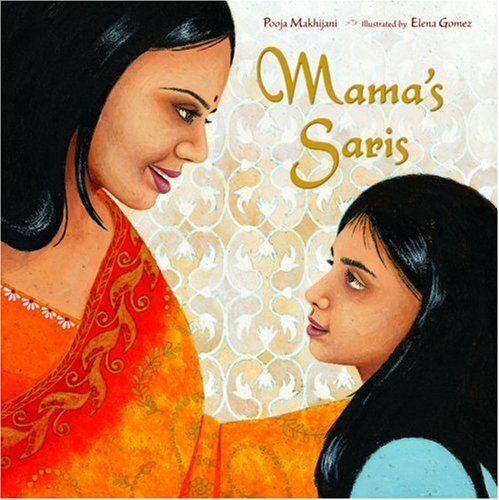 A sweet book universal in a daughter’s desire to be like her mother whether it's walking in her high heels or wearing her bindi. Reference is made to the mother’s every day working clothes, implying the that the story takes place outside of India. A helpful glossary makes the Hindi words accessible to all readers, while beautiful illustrations bring magic to the story. For more choices, take a look at this list of 50 Multicultural Books Every Child Should Read put together by the Cooperative Children's Book Center. A few weeks ago I wrote that I was a little jealous of a young patron who was reading Harry Potter and the Deathly Hallows. Truth be told, it wasn't just that he was reading it for the first time... it was that he was able to read it at all. He had started the series only a month earlier and had already worked his way through nearly all seven books. It was such a contrast from all the years I waited for the entire series to be published. Would the series have been so successful if the books had been published closer together or farther apart? I don't think it would have mattered. Series books are episodic by their very nature. At one point in time, nearly every series ever published is unfinished... but we tend to forget that when we have the whole series in front of us. For example, I remember mentioning the torturous wait for Harry Potter 6 to my boss at the time. She responded by telling me how difficult it had been for her to wait for the whole Lord of the Rings series to be published. On the other hand, there's also the sheer joy of being able to pick up the next book in a series (any series) right away. It lets you continue living in the author's magical world for just a bit longer and it helps with continuity. My mom read the first few Harry Potter books as they came out, but they didn't do much for her at the time. She kept forgetting the characters and plot lines... and reached the fourth book without being quite sure she knew who You-Know-Who was. After all the books were published, she read the whole series together and found it a far more enjoyable experience. The intricacies of the story were much easier for her to follow. Sometimes, we may not even realize we're reading a series. A teenage patron recently showed me her summer reading log, and I noticed she had given a very low rating to Dark Whispers by Bruce Coville. I asked if she had enjoyed the other two books in the Unicorn Chronicles. She replied by saying she had no idea Dark Whispers was the third in a series... but that it would explain an awful lot. I've also talked to people who claim not to mind reading out of sequence. There are kids who will read whichever book happens to be on the shelf at the library. For some series, it really doesn't matter which order you read them in. Usually, I just recommend reading the first book published before reading the rest. But I always wonder about kids who read, for example, Harry Potter #6, then #2, then #7. Are they getting anything out of the books? Does it make any sense? On the other end of the spectrum, I frequently see kids who love to read in order. No matter the series, whether it's the Magic Tree House or Geronimo Stilton, they want to read every book according to its number. For these kids, there's nothing more valuable than a good series database. Sometimes, the numbers themselves aren't entirely straight forward. Let's take the Little House on the Prairie series by Laura Ingalls Wilder as an example. When I was reading the books, they were numbered in this order: #1 Little House in the Big Woods, #2 Little House on the Prairie, #3 Farmer Boy... etc. That has since changed, and the current numbers on the sides of the books are: #1 Little House in the Big Woods, #2 Farmer Boy, #3 Little House on the Prairie. I had a young patron tell me recently how much she had enjoyed Little House in the Big Woods, but #2 (Farmer Boy) made her stop reading the series. Sometimes, I think in the quest to be chronological, publishers can sometimes leave a good story by the wayside. As for how to number the series, I think this list is the best. How do you like to read a series? Slowly and methodically over time, or in one big gulp? In order or out of order? Has chronological numbering versus publication date ever been an issue for you in a series you've read? Have you ever waited for a series to be fully published before you started it? With the end of summer upon us (Wahhhh! ), here are some going-to-school picture books. A fun, clever book that will be appreciated by a wide range of readers. 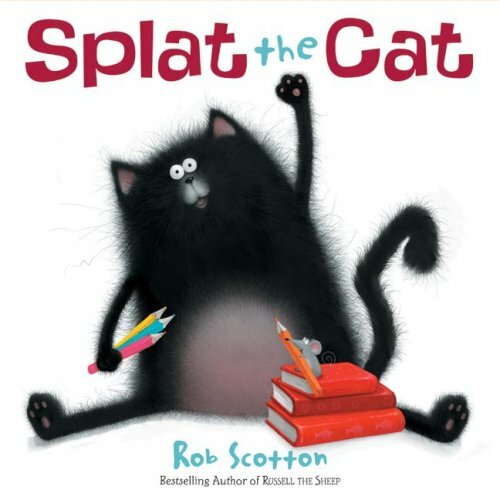 Scotton, of Russell the Sheep fame, brings his humorous and fantastically off-beat illustrations to the world of cats  plus a mouse. Splat is worried about his first day at Cat School. If you’re not sure that he’s really worried, look at his big, wide eyes. He tries to hide, and stall, and even hang onto the gate, but his mom gets him to school. There he learns that cats chase mice. Hold it! Splat has a pet mouse! That he brought to school! This isn’t going to be good for anybody. But of course it is, and all the cats learn a new lesson. All-around wonderful book. When we last saw Jake, his parents were trying to get him to sleep by going everywhere around the house with him. Well, Jake is still having separation issues at school, where he cannot let go of his parents. He literally clings to them through the whole day, making the seesaw hard and bathroom breaks impossible. 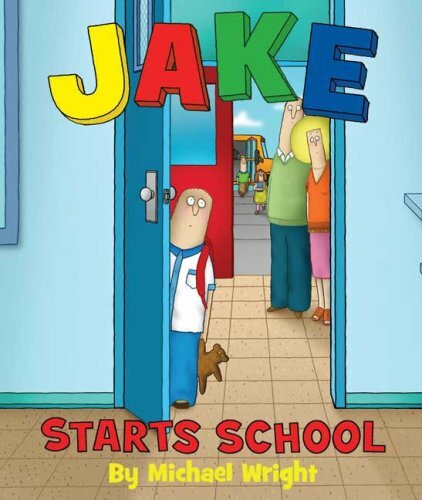 The teacher is finally able to engage him with a book with the same name as his dog, and Jake finds his school groove. Bright and wacky illustrations fit the silly  and sometimes strained  rhyming text. (“There it was, Room Number 1/where Jake would join his class./It looked so big, he felt so small,/he passed a little gas.”) I can't call this my favorite book, but kids will enjoy the silly take on starting school. This isn’t Keisha Ann’s first day at school, but she shows how it’s done with cheer and confidence. She catches the bus, waits in line, passes out paints, shares with classmates, and takes turns. This book represents an interesting  and needed  approach to going-to-school literature by focusing on the positive. I also liked that the girl was African-American, as I would like to see more children of color in books. Newest reports say that 44 percent of children in the United States are now minorities. Perhaps we might want to show more of them in books. Not just for them, but so all children can see kids of different races featured in stories. Keisha Ann Can! is simple in language, making it best for the preschool or first day of kindergarten crowd. Last week I asked this question: "What children's book would you love to be able to read again for the first time?" The question struck more of a chord than I ever could have imagined. Between responses on Booklights, Facebook and Twitter, my question was answered over 600 times! Being a curious person, I had to find out which books were mentioned the most. The numbers listed next to the titles refer to how many times that book or series was mentioned. 10. The Anne of Green Gables series by L.M. Montgomery, Island of the Blue Dolphins by Scott O'Dell, Where the Red Fern Grows by Wilson Rawls and the Little House on the Prairie series by Laura Ingalls Wilder (7 times each). I'm a huge L.M. Montgomery fan, I'd love to read some of her books again for the first time. In the Anne of Green Gables series, the one I'd pick is Anne of the Island. 9. The Little Prince by Antoine de Saint-Exupery (8 times) At least half the respondents on this book said they prefered the French version. 8. The Golden Compass by Philip Pullman (10 times) The trilogy His Dark Materials was mentioned only once. Interestingly, the majority of the votes were specifically for The Golden Compass. 7. Alice's Adventures in Wonderland and Through the Looking Glass by Lewis Carroll (11 times). I just found my old dog-eared copies of these terrific books. What wonderful memories! 6. The Secret Garden by Frances Hodgson Burnett (12 times). I actually just read this for the first time last year. I wish I had discovered it when I was a child. We've reached the halfway point, and are starting to climb into the big numbers. 5. The Lion, Witch and the Wardrobe and the Chronicles of Narnia by C.S. Lewis (19 times). Oh, the magic of discovering what's in that wardrobe! Who can forget that? 4. To Kill a Mockingbird by Harper Lee (22 times). A perfectly written book. It's amazing what an effect Harper Lee has had on so many generations. I read this book in high school, although I recently had a mom (who hadn't read the book) try to convince me that it was appropriate for her third grader. 3. A Wrinkle in Time by Madeline L'Engle (25 times). This book ranks high on every children's book poll I see such as: "What's your favorite book from childhood?" or "What's your favorite Newbery book?" The answer is always A Wrinkle in Time. Interesting side note: did you know that this book was rejected by over two dozen publishers before it was finally accepted? The numbers jumped way up for the last two, both of which are series. 2. The Hobbit and the Lord of the Rings Trilogy by J.R.R. Tolkien (38 times) Great, great books. I remember my first time reading these very vividly. Frodo was climbing up Mount Doom and my mom came in and asked me to clean up my room. I recall telling her in a passionate voice that I had read hundreds and hundreds of pages just to get to that point and I couldn't stop. I had to know what happened next. Fortunately, she took pity on me. 1. The Harry Potter series by J.K. Rowling (41 times) As a die-hard Harry Potter fan, I couldn't agree more, but I was surprised that Harry beat out Frodo. I was on the edge of my seat for every single Harry Potter book. Whenever I thought I had figured it all out, Rowling took her story in another direction and surprised me every time. She made me gasp, cry and laugh in a way I never have while reading a book. It was an unforgettable ride. But as much as I loved that thrilling, spine tingling first time, it was in the re-reading where I discovered the true magic. Rowling planned out all seven books before the first one was even accepted for publication. All the books are full of subtle, deftly hidden clues and wonderful misdirection that are a delight to discover. For more about the joy of reading a favorite book over and over, check out Jen's excellent post on the subject. Now, on to the runner-ups. Although they didn't make the top ten list, here are the children's and young adult books that were mentioned multiple times. They're in alphabetical order by author. -The hands-down winner was Jane Austen's Pride and Prejudice. -Animal Farm, The Grapes of Wrath, Watership Down, The Princess Bride and Mists of Avalon tied for second place. -1984, The Foundation Trilogy, Gone with The Wind, Interview with a Vampire and Of Mice and Men came in third place. "I would love to read Goodnight Moon with my mom and dad again for the first time." "I've read A Wrinkle in Time and A Christmas Carol more times than I can count, but nothing compares to the moment I discovered those worlds. They were more real than reality to me." "The first book that got me really excited about reading was at about ten years old: The Silver Crown by Robert O'Brien. Nothing compares to that first book you can't put down." "I can't leave out the first book I remember checking out from the library: The Fuzzy Duckling. "I'd like to return to fourth grade so I could hear my teacher Mr. Orr read The Thief of Always out loud again. That was an incredible experience for me." "So if for one more time, I could be a riveted six-year old, I would like to go sit in my father's lap, and read Harry Potter and the Sorcerer's Stone just once more." Thanks so much for sharing all your wonderful comments and experiences. The best part is yet to come. That will happen when you find a book on this list you've never read before and try it for the very first time. Or better yet, when you read it to a child and watch them experience it for the first time. Welcome to Show and Tale, a new Tuesday feature from Booklights. Each week, we'll be asking a quick question about books: your all-time favorite, your current read, the bedtime story your kids ask for every night. We're starting out with a simple but hard-to-pick-just-one question: What's your favorite children's book and why? Esther picked Brown Bear, Brown Bear from Bill Martin Jr. and Eric Carl. "I've got great memories of my third-grade teacher reading it to our class." Cindy picked Don't Let the Pigeon Drive the Bus from Mo Willems. "My 2.5 year old loves it because she gets to say 'NO, PIGEON' on every page." Susan picked Richard Scarry's What Do People Do All Day?. "It shows moms and dads working in and out of the home." So what's your favorite and why do you love it? Tell us below for a chance to win free books from Booklights.